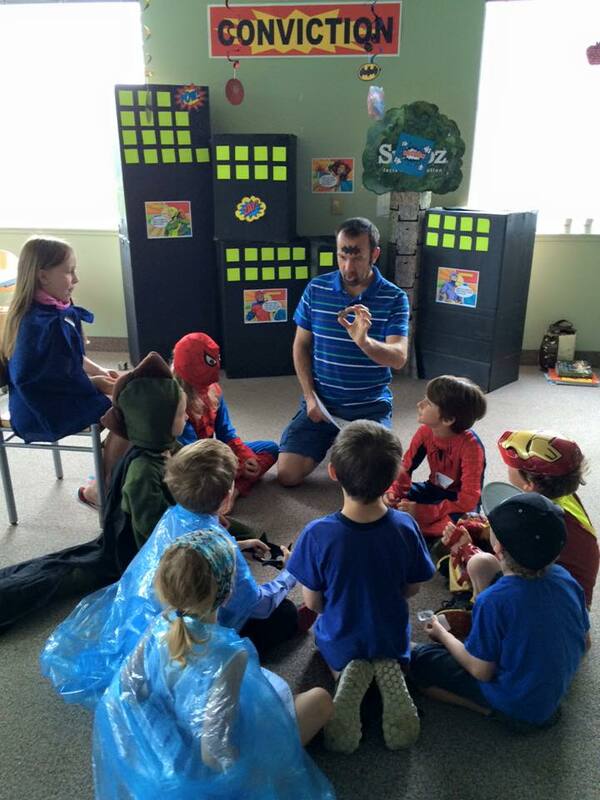 Our children's ministry is a great place for kids to develop character and learn about God on their own level. Our AdventureLand children's program serves children from infancy to Grade 5, allowing them to learn about God at their own level while their parents participate in the worship service. Each week, our loving volunteers prepare fun activities and lessons that engage the kids, encouraging them to learn about the Bible and develop character. After signing them into the program, many Sundays the kids will join us for the first few worship songs (complete with their own rhythm instruments), before heading back to their own classes. Read on to find out more about our classes and what to expect. We are very serious about protecting our children, and have strict policies in place to ensure they remain safe the whole time they are in our care. All of our volunteers go through an application process that includes a vulnerable sector criminal history check from the Ontario Provincial Police. Teachers are never alone and unsupervised with the children and their behaviour is directed by clear guidelines for classroom discipline and appropriate contact. If you would like to review our policies, please request a copy from our AdventureLand Director. As part of our safety procedures we ask that all parents fill out an information card on their first visit, and sign children in and out when dropping them off and picking them up. Our nursery for 0-2 is filled with toys and books, and staffed by loving volunteers. Our Butterfly class is for preschoolers and kindergarten children. The "First Look" curriculum we use lays a foundation of knowing about the Bible and God, and focuses on three truths: God made me, God loves me, and Jesus wants to be my friend forever (more information below). Our Bears class for Grades 1–3 uses the 252 Basics curriculum to teach virtues using Bible stories and Scriptures. The three basic truths this curriculum focuses on are: I need to make the wise choice, I can trust God no matter what, and I should treat others the way I want to be treated (more information below). The Moose class is for Grades 4-5. As these kids are maturing, their lessons get them reading the Bible as a group, and thinking through how their faith can impact their day-to-day lives. As they graduate our Sunday morning AdventureLand program, they move into our youth group in Grade 6 (click for more information). We have been using curriculum produced by Orange for several years now, and it is loved by both teachers and children. Their First Look curriculum helps younger children. 252 Basics is geared toward the older kids, and helps them learn virtues such as ... with Bible stories and memory verses. Watch the following videos to learn more, or visit their website.